He worked from 1837 to 1843 as a jeweler and watchmaker in Philadelphia PA working first for Samuel Hildeburn, then with JOHN C. FARR & Co. 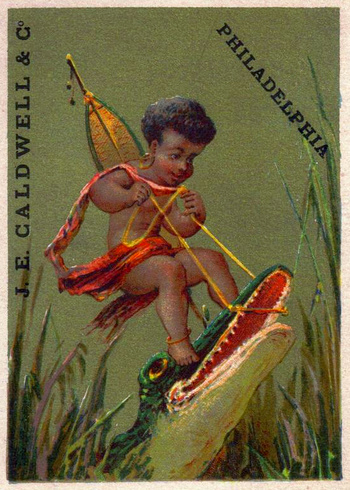 He was a partner from 1848 to 1856 with John C. Farr in Philadelphia PA as J. E. CALDWELL & Co, listed in the 1850 city directory at 140 Chestnut Street. 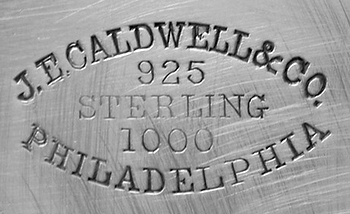 Alternate Mark for J. E. CALDWELL & Co. He appeared on the 1860 census taken at Philadelphia PA, listed as a merchant. He appeared on the 1870 census taken at Philadelphia PA, listed as a jeweler. He appeared on the 1880 census taken at Philadelphia PA, listed as a jeweler. 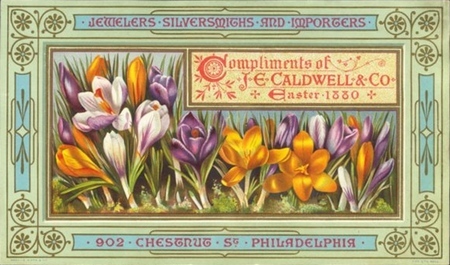 James Emmot Caldwell, whose name is inseparably connected with the history of the jewelry trade in Philadelphia, died on Saturday, at his residence in Germantown, in the sixty-ninth year of his age, his death being the result of exhaustion consequent upon old age and a complication of diseases. Mr. Caldwell was born in Poughkeepsie, Dutchess county, N. Y., August 15, 1813. In his school days he was a classmate of Theodore Cuyler, Benson J. Lossing, Jackson S. Schultz, the Vassar brothers, who afterwards won distinction, and who remained his personal friends through life. 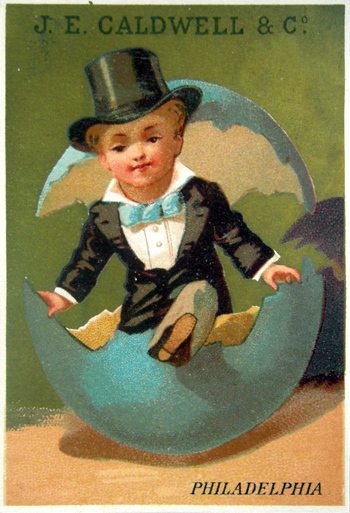 Early in life he was apprenticed to the silversmithing trade with Peter P. Hayes, at Poughkeepsie. Mr. Caldwell was the youngest apprentice in the establishment at that time, while the oldest was Joseph T. Bailey, between whom and the deceased there sprang up an intimacy that ripened into warm friendship in after life. After having completed his apprenticeship, he entered the employment of the elder Benedict, in New York city, where he learned watch-making in all its branches. In 1836 he came to this city, where he was at first employed in the wholesale jewelry house of Samuel Hildeburn, on Market street. 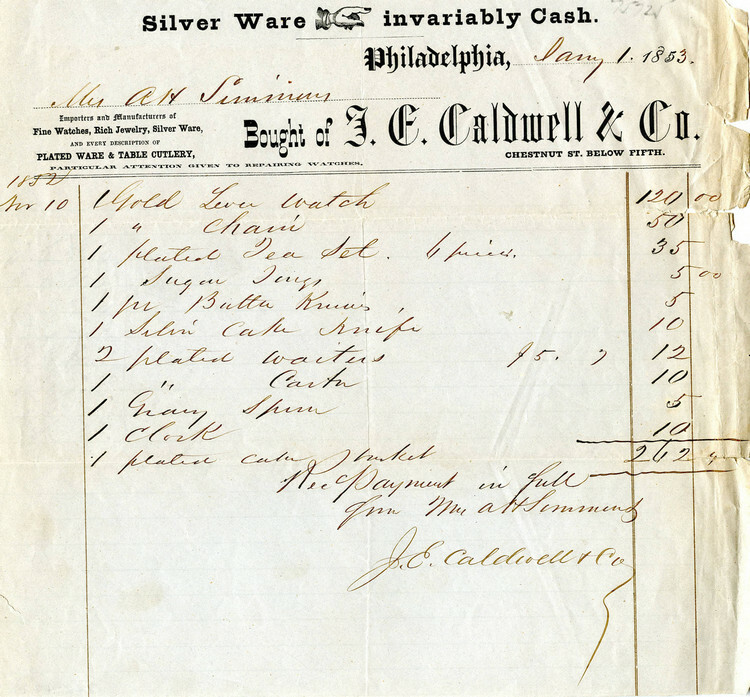 He afterwards entered into the employment of John C. Farr & Co.
About the year 1840 Mr. Caldwell opened a retail store on Chestnut street, below Fifth, in the building afterward used as its office by the Franklin Insurance Company. A year or two later he removed opposite to the building then No. 140, where he remained until 1858. At first the firm had been Bennett & Caldwell. 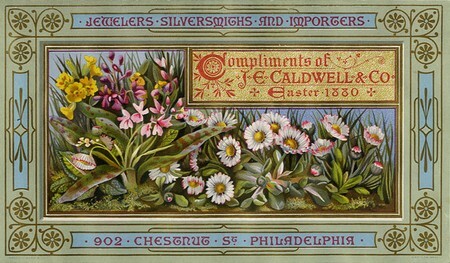 Upon the death of Mr. Bennett John C. Farr became associated with Mr. Caldwell, and the firm became J. E. Caldwell & Co., the style that is still retained. Mr. Farr retired after a few years, when Messrs. Edward Langton and Richard A. Lewis became Mr. Caldwell's partners. They still remain in the house. 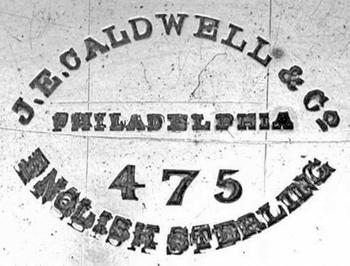 The energy, enterprise and business sagacity of Mr. Caldwell resulted in such a rapid growth of the firm's trade from the start that repeated enlargements and removals were made necessary from time to time, inorder to gain the greater facilities demanded. In 1858, the business was removed to Chestnut street, below Ninth. Before the ten year's lease expired, the firm removed in 1867 to its peresent location, No. 902 Chestnut street. The following year a terrible fire occurred, in which two clerks employed by the firm were burned to death. With characteristic energy, Mr. Caldwell went to work, and, before the smoke lifted from the ruins of the destroyed building, he had the present palatial marble structure contracted for. Mr. Caldwell was a genial, companionable man, friendly and honorable in all his acts. His charity was unbounded, both in private dispensation and in his aid and support of many of the noblest of Philadelphia's practical benevolences. He was connected with Calvary Protestant Episcopal Church, Germantown, being for many years its accounting warden. He was a member of the Union League, and for a long period, one of its directors. He was also a director of the Farmers and Mechanics' Bank, and was identified, more or less prominently, with a number of useful organizations.